Next season will see two new DC shows on network television with the Arrow/Flash spinoff Legends of Tomorrow (yes, yes, terrible title) on CW and Supergirl on CBS all from the same production teams. I find myself far more excited for the DC side of things on television than I do for the films that follow the terrible Man of Steel and will continue with the horribly dry and dreary looking Batman v Superman. CBS gave an over six minute look at the upcoming show during upfronts, and I have to admit, it has me excited. I have to say this appears to be the best live-action portrayal of a Super-family member we've had since Christopher Reeves. It's only six minutes, but they seem to get who Kara is and who the El family is much better than Zach Snyder. Count me in for this! 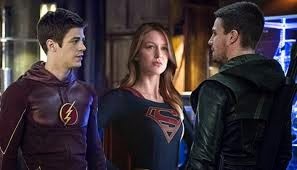 Being from the same producers, there are rumors that Supergirl could crossover with Arrow/Flash/Legends. And while they are on different networks, CBS owns a stake in CW. This, of course, means that Superman is a part of the Arrow/Flash universe! And that's awesome. You know who else is a part of that universe? Green Lantern. As in the Hal Jordan Green Lantern! In the latest episode of The Flash, Barry used an abandoned Ferris Air for a covert operation. Captain Cold questioned Barry, "I thought they closed this place down." Barry answered, "They did. One of their test pilots disappeared." 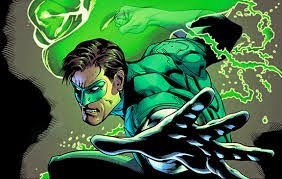 Those who know their Green Lantern lore know that the pilot that disappeared could be none other than Hal Jordan who found a dead Green Lantern and was given his ring, which took him deep into space to Oa where he would learn to wield the power of the Green Lantern Ring and master his will. It was such a blatant reference, I would be shocked if Hal Jordan/Green Lantern doesn't make an appearance next season. After all, in the comics, Hal is best friends with Oliver Queen and Barry Allen (otherwise known as Green Arrow and Flash). Some people are also postulating that John Diggle on Arrow might become a Green Lantern as well (and honestly he would make a great one), and there are some striking similarities between Diggle and John Stewart (who is a Green Lantern in the comics). That would be awesome, but I am skeptical of that theory. Mainly because it would be too smart a move, and let's be honest here, Arrow doesn't seem to make too many of those. Let's get to the negative part of this post, before we close it up with some positiveness. Spoilers for this season of Arrow will follow. Arrow has been awful this season. Throughout the show's run, there have been some questionable writing decisions. Laurel is one of the worst characters in television history, but the fact that she has never been consistent (or perhaps has been consistently inconsistent) seems to have moved to all of the other characters this season. This season has typified one of the worst sins that storytellers can make: forsaking character in order to facilitate story. Oliver and his friends constantly do things that make no sense for their character in order for the story to work. The most recent example is of course Oliver not telling his friends anything about his plan to work with Ra's al Ghul in order to ultimately take him down. (And the fact that Oliver kills him undoes all of the legitimate character work that they had done over the last three seasons teaching Oliver that killing is never the answer, unless, I guess, it is). The least they could have done was have Oliver leave them out of the loop since they left Oliver out of the loop on the whole Roy Harper isn't really dead thing while they were planning on faking his death. Of course, that made even less sense, since not knowing the plan made it almost impossible for Ollie not to go off and attempt a rescue himself, which would have ruined everything. And it made zero sense that Oliver held off not trying to rescue Roy, except that of course the story needed him not to. By not telling each other of their plans, however (Ollie not telling the team about his Ra's plan and Team Arrow not telling Ollie about the Roy Harper plan), the writers were able to keep the viewers in the dark. Look! Drama! Because they wanted to keep the viewers in the dark, it required the characters doing things that the characters as they have been set up over the last three years that they would never do. Look, you can have characters act contrary to the way they normally would. You just have to have a good reason for it, a good in story/character reason for it. Your reason can't be "because the story requires them to act like this." This season did a fantastic job of selling me on the fact that Felicity and Ray Palmer (who despite the fact that up to this point his ATOM suit is very much a cheap Iron Man rip-off, but that's for another post) have fantastic chemistry and work together as a couple. Previously the show has done a great job of selling me on Felicity's crush on Oliver, but has never once made me think that Oliver feels anything whatsoever romantic towards Felicity. But then, out of nowhere, this season, Oliver admits to feelings for Felicity. I never once bought it, and it completely weakened the ending of the season. Arrow didn't earn Oliver and Felicity together. At all. All it did was make me wonder how the hell Ray took it so in stride when Felicity left him for Oliver (who everyone happened to think very well might be evil at the time, I might add, making the whole thing make even less sense!). I'm glad Ray is leaving for a new show next season. He deserves better than the Arrow writers have given him thus far. The plus side, of course, is that The Flash has been pretty terrific throughout its freshman season. Even better than Arrow was when it started (and remember, Arrow finished second to Elementary its first year in the Josh's Choice For Best New Show of the Season Award). And, perhaps there is some hope that some of the awful mistakes Arrow has made can be somewhat fixed by the events of The Flash's finale next Tuesday (May 19). Barry has plans to go back in time to stop the murder of his mother. This was the plot of Flashpoint in the comics which rebooted the DC universe. While, I've no doubt that Barry will ultimately fix the timeline from the huge change preventing his mother's murder will probably cause, there will be a chance to keep a few things changed. Namely, I suspect that Sara Lance (the Canary we deserved on Arrow instead of the terrible Laurel) will no longer be dead (since it was announced today that the character Caity Lotz who played Canary will be playing on Legends of Tommorow is in fact Sara Lance) and that Oliver Queen will be cleared to return to action as Green Arrow (and maybe taking the actual name instead of just The Arrow). Until Next Time, perhaps it will retcon this entire season of Arrow and we can all pretend it never happened.